(Nanowerk News) The Center for Research in Advanced Materials (CIMAV), located in the Research and Technological Innovation Park (PIIT) in Monterrey, in the north of Mexico, has developed reinforced graphite nanoplatelets seeking to improve the performance of solar cell materials. The work done by Liliana Licea Jiménez uses this material because it has a large power capacity. These polymer-based nanocomposites are reinforced with graphite nanoplatelets for its use in the industry. Nanocomposites are formed by two or more phases, in this case by a polymer, reinforced graphite nanoplatelets, one allotropes of the carbon in nanoscale. "The sectors focused on the use of these nanomaterials are diverse; nanoplatelets impart or give new properties to materials; this allows us to move into the automotive, construction, aerospace, textile and electronics sectors which are demanding and where the use of nanomaterials is an opportunity," explains Licea Jiménez. According to the specialist at CIMAV, what has been obtained in research is already applied in some concept testing for companies that have led the nanomaterial form the lab to the industry for mechanical and thermal modification in the construction industry. 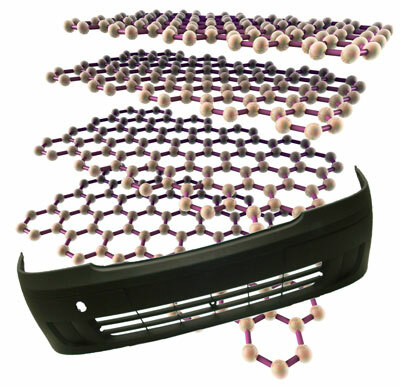 "Nanocomposite materials are already used in fenders and panels in the automotive and textile industry." The development of nanocomposites in this research center is an opportunity for different industry sectors; graphite nanoplatelets give added value to the product, as they improve its mechanical, thermal and electrical properties. And they have an impact on the industry because the business demands are increasing and the use of nanocomposites is an opportunity to improve the product. "Even some of the companies we have worked with mentioned in several forums that they have had a good response in the use of these nanomaterials." She also sffirms that the nanocomposites Laboratory in Monterey has achieved success cases, but recognizes that they need to dabble in sectors such as aeronautics, among other areas. Jimenez Licea indicates that in addition to companies in the northern state of Nuevo Leon, there are companies in other states that have shown interest in polymer nanocomposites; "It is an advantage to work with research projects demanded by the industry, because they have a specific function for each company." This is because each nanocomposite is a material that has two or more constituents, in this case the polymer and a nano-sized reinforcing material: the graphite nanoplatelets.